If you’re going gigging, and want to try frog as a main dish but have no other ideas besides deep frying, then this recipe is for you! Tough chewy frogs legs are tenderized and garlicky after being poached for hours in a water bath. The meat falls off the bone, and that’s just fine with me since I’m adding it to a carrot/pea risotto!! And I just love the beautiful orange risotto which reminds me of Fall leaves. Combining meat, veggies, and carbs for a cold weather day makes this dish the best starter to Autumn dining. Enjoy!! If you're going gigging, and want to try frog as a main dish but have no other ideas besides deep frying, then this recipe is for you! Tough chewy frogs legs are tenderized and garlicky after being poached for hours in a water bath. The meat falls off the bone, and that's just fine with me since I'm adding it to a carrot/pea risotto!! And I just love the beautiful orange risotto which reminds me of Fall leaves. Combining meat, veggies, and carbs for a cold weather day makes this dish the best starter to Autumn dining. Enjoy!! Slice down between the double frogs legs to separate the two. Remove the “calf muscle” and reserve (separating the frogs legs is purely for presentation, so you may omit this step and leave the legs whole and skip steps 3 and 4, if you like). French the thigh muscle by making a small cut around the knee joint and scraping the meat toward the opposite end to create little “lollipop shapes”). Continue until all the calf and thigh muscles are prepped. Pre-heat the Sous Vide Supreme to 57ºC/135ºF. Pat the frogs legs pieces dry and place all the frogs legs calves and thighs into the vacuum bag. Vacuum seal the bag and place in the Sous Vide Supreme and set the timer for 4 hours. Once the timer goes off, remove the bag and drain the liquid and discard (or reserve for risotto if you like). (**If you will not be using the frogs legs right away, place the bag in ice water for 20 minutes, then place in the fridge until 1/2 hour before serving time). If using right away, after draining the liquid, scrape the meat from the calf muscle, only, and reserve the meat and discard the bones, and set the calf meat and thigh “lollipops” aside, while prepping the risotto. Heat the broth to boiling, then turn down to low simmer. Mince the onion and add onion, and risotto rice to a large heavy bottomed pot. Sauté the onion and risotto rice over medium heat for 2 minutes. Pour in wine and begin stirring until the wine is absorbed. Begin timer for 15 minutes and stir while adding hot carrot broth 1/2 cup at a time. Continue stirring until the carrot broth is absorbed then add another 1/2 cup. Keep stirring until all the 6 cups carrot broth is absorbed or the timer goes off. Once the timer goes off, add the fresh/frozen carrots/peas and stir for another 3 minutes. Turn off the heat, and add the mascarpone cheese, stir. Taste the risotto and add salt and pepper to taste. Top with sautéed frog pieces. Heat a large sauté pan with oil and butter over medium high heat. Add the calf meat and thigh lollipop meat and quickly sear to brown slightly. 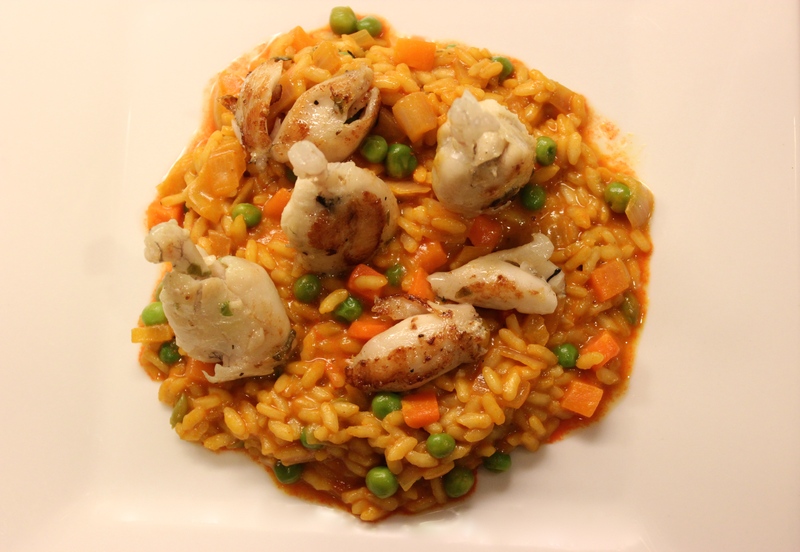 Top the risotto with the frog meat. Tips on making risotto: 1. make sure the stock is boiling hot (if the broth is cold the starch will not release from the rice and the risotto will not develop it's creamy texture. 2. Altitude makes a difference on how long the risotto will take to cook (I'm at 52ft. above sea level so my risotto is completely done at 18 minutes, but yours may take longer depending on the altitude at which you reside.